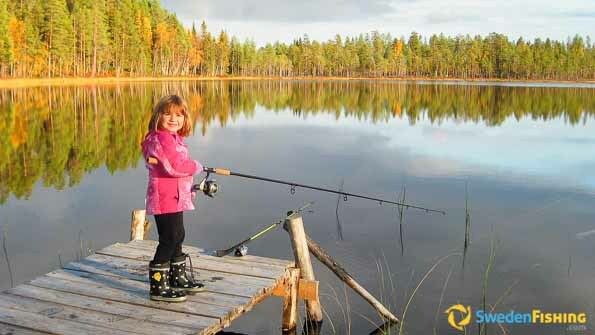 Central Sweden holds no end of varied fishing settings, ranging from the east coast all the way to the southern alpine regions. This is true whether you want pike or some other salmon-like fish. Starting your fishing trip to central Sweden is simple and comfortable using ferries, low-price flights or perhaps SAS fly-and-drive. In our elongated land, the central parts offer a host of opportunities for sports fishermen, ranging from lakes galore to running waters and wave-lapped coast. There are immense, sparsely settled areas with waters that seldom or never see a sports fisherman. It is easy to find that special place where you can fish by your self. Even here pike is the dominating species sought by the fishermen, though joined by perch and in some waters zander. In the upper interior of the forests there are even smaller waters with plenty brown trout that have seldom seen a hook. Farther to the west of this area we reach the edge of the lower alpine region with all fishing available there. As the sun sets over a stream in central Sweden, an angler ties on a new fly. Anna continues: “Pike isn’t only found in the fresh waters of lakes and rivers, but also thrive in the brackish waters of the Baltic Sea, the Gulf of Bothnia and Åland Sea coastlines to the east.” Sports fishing is free of charge along the coasts, but new rules limit you to three pike per day in the 40 to 75 cm range. Fishing in lakes and running waters inland requires a fishing licence for the specific to the waters to be fished. These can be bought at local tourist bureaux, stores and petrol stations showing a blue sign with a white bottom and black fish symbol. Perch can often be found in the same waters as pike, but are frequently fished using different lures and methods. The brown trout is normally less common, but is a superb and much appreciated sport and food fish. Sunset and dawn are often the best fishing times of the whole day, here on the coast of Blekinge. As we approach the alpine region, we find lakes and running waters with a good mixture of grayling, pike and trout, as well as the occasional brown trout. According to Anna, “waters with several species often lead to good sized individuals and to excellent fishing for large parts of the season using both fly and spin.” Since the grayling spawns in the spring they can be fished well into the autumn and it is at its best in September in the southern and eastern parts of its range. Sven continues her thoughts, adding “ that a number of larger and smaller waters run from the western mountains in the alpine region, either to the coast in the east or south to Lake Vänern. Closer to their sources you’ll find mostly grayling and lake trout. In the mid-section pike dominates and closest to the sea it’s usually good salmon and brown trout country. 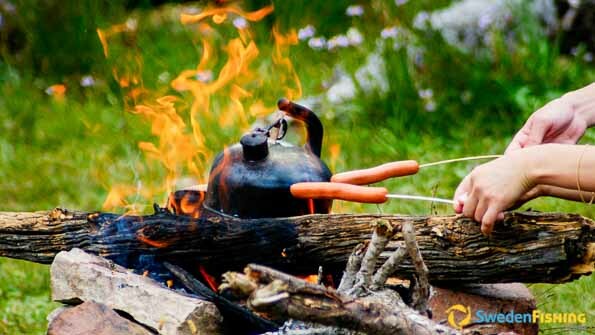 You’ll also find thousands of small lakes, both forest tarns and plains lakes of all sizes.” The lakes are dominated by pike and perch, though many of them also have good brown trout spots. Whitefish can be found in most of the waters. All in all there are more than 30 different species. Of the larger rivers with large drainage areas the Klarälven River empties in Lake Vänern, the Dalälven River flows some 150 km north of Stockholm and the Ljusnan River farther north near Söderhamn, both emptying into the Gulf of Bothnia. Further south lie Lakes Hjälmaren and Mälaren whose waters empty into the Baltic Sea via a short waterway at Stockholm. Both lakes offer free hand tool fishing. Even in central Stockholm below the Royal Palace and the Parliament House there is good fishing for salmon-like fishes, as well as at times even zander and perch. The central Sweden fishing season is about a month shorter than in southern Sweden. Normally the waters are ice free from April through November. “Best time to catch the real giants is spring and early summer (April-May) and the end of October into November,” explains Anna. 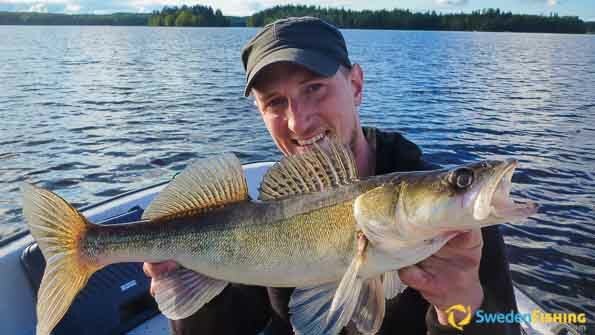 “In high summer from June through September you can catch many pike, but the big ones are rarer when it’s warm.” Trout, zander and various whitefish is best from June through early September.